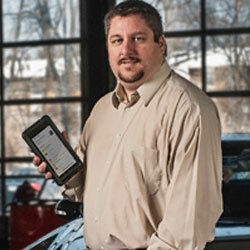 The automotive aftermarket has been rapidly revolutionizing global changes in the automotive industry. Several Original Equipment Manufacturers (OEM) and dealers are finding it difficult to establish their presence in the aftermarket space, due to the unorganized behavioral patterns of customers and lack of sufficient technologies to track them. In an attempt to tackle this, along with a vision to automate the least technologically concentrated area of the automotive industry—repair and shop management, Michael Risich founded BOLT ON TECHNOLOGY in 2008. BOLT ON TECHNOLOGY provides innovative solutions for automotive repair facilities that power boost the process of repair and shop management. The company builds programs and tools that enhance the abilities of the most popular shop management systems and data retrieval processes, resulting in a more profitable and efficient experience for thousands of repair shops across the U.S. and beyond. “Whatever direction we see other companies go in, we simply go the opposite way to explore more opportunities and to stay ‘relentlessly innovative.’ Our customers have benefited from, and are satisfied with our creative technologies, as it makes their lives a lot smoother and less hectic,” says Risich, CEO, BOLT ON TECHNOLOGY. The majority of automotive companies in the U.S. are managing their shops with either people, processes, or technology systems that are overwhelmed, faulty, and outdated—resulting directly in increased overhead and lost profit opportunities. The company believes in doing more, with less human resources, as this directly influences shop costs and reduces human error. “Our technology eliminates the risk of redundant tasks and missed opportunities to generate revenue, such as scheduling a customer’s next visit—while they’re still in the shop, and also sending customer reminders before the appointment is mistakenly missed,” he adds. ‘Bolting on’ to traditional modules, the company has built software programs that enable hassle-free operations during the repair and management process. Their flagship products—Mobile Manager Pro, Report Pro, and Lube Sticker Pro (plus several others) have been appreciated by shops across the U.S., Canada, South America, and Guam. Mobile Manager Pro (their best selling product) solves the traditional problem of repetitive shop processes, outdated customer interactions, and inaccurate vehicle details—no more chicken scratch. This tablet or mobile solution can send a personalized diagnosis with photos to customers via text and email, along with digital inspections, service recommendations, and estimates. Report Pro enables repair centers to send customized job invoices directly to a customer’s email (with additional service recommendations) and also provides a better technician worksheet with categorized service history. Lube Sticker Pro gives service providers not only the benefit of printing key tags and stylish LOF windshield reminders, but the integrated ‘smart software’ keeps a record of the date and vehicle registration, which helps shops remind customers about upcoming services by using gathered data to predict the next service date and mileage needed to generate a recommendation. Some of the other products and solutions for the automotive industry include—Mobile Assist Pro (new kiosk technology), Message Manager Pro, Quick Charge Pro, Dashboard Pro, Rapid Entry Pro, State Safety Cards, and MV-431. With over 275,000 repair centers in whole of the U.S., including subsidiaries and chained-repair outlets, the company looks to penetrate deep into the automotive aftermarket. “We understand that connected devices are the future of this industry, and we’re closely watching the movement of technology and every player, to ensure we stay not only the leading provider, but also the most results driven solution available. The industry needs help—that’s what we offer,” concludes Risich.